Kenneth Blasingame is an artist and designer and native Texan. 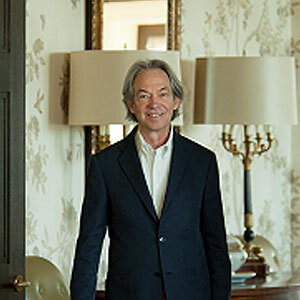 His design work includes the Texas Governors Mansion and the White House as well as various projects in homes throughout the U.S. Blasingame works in many genres, from American Antique to English and Mexican Colonial styles. Ken was owner of the retail shop and gallery “Blasingame’s” in Ft. Worth. Most recently Ken’s design work at the Prairie Chapel ranch of President George W Bush and First Lady Laura Bush was featured in Architectural Digest Magazine. From 2002 to 2008 Blasingame was a member of the Committee for Preservation of the White House. Blasingame lives in Ft. Worth, Texas, and Santa Fe, New Mexico.